Monsanto Says Genetically Modified Ants Could Replace Honey Bees-Fiction! - Truth or Fiction? Monsanto Says Genetically Modified Ants Could Replace Honey Bees-Fiction! Monsanto plans to replace honeybees that are wiped out by pesticides with genetically modified ants. There aren’t any plans to replace honeybees with genetically modified ants. A team of researchers at Monsanto believe they might be on the verge of finding a solution to the mysterious drop in honey-bee populations all over the planet, a threat that endangers the world’s food supply as a whole. The $3 million dollar grant from the Environmental Protection Agency (EPA) has led the team of researchers at Monsanto to develop alternative strategies to “survive” an eventual honey bee Colony collapse disorder (CCD), a phenomenon that has been increasing in the past decade and that occurs when the majority of worker bees in a colony disappear, a situation that could “dramatically impact the world’s food supply”, admit experts. “Latest studies have found a link between neonicotinoid pesticides that are vastly used in GE corn crops. As GE farming has become an essential part of agriculture in today’s modern world, we had to develop ways to promote both the continuity of GE farming and the survival of the honey bees, a fascinating challenge” admits John Leere, head biochemist of the project. Protect the ‘natural’ species we have. Stop the use of indiscriminate pesticides. We are killing them off, lets stop and infest the huge amount of money monsanto are chucking about. To make this a world we actually ‘share.’ Stop with the genetics we’ve destroyed enough wildlife already! Bee pollination is responsible for more than $15 billion in increased crop value each year. About one mouthful in three in our diet directly or indirectly benefits from honeybee pollination. Commercial production of many specialty crops like almonds and other tree nuts, berries, fruits and vegetables depend on pollination by honeybees. These are the foods that give our diet diversity, flavor, and nutrition. 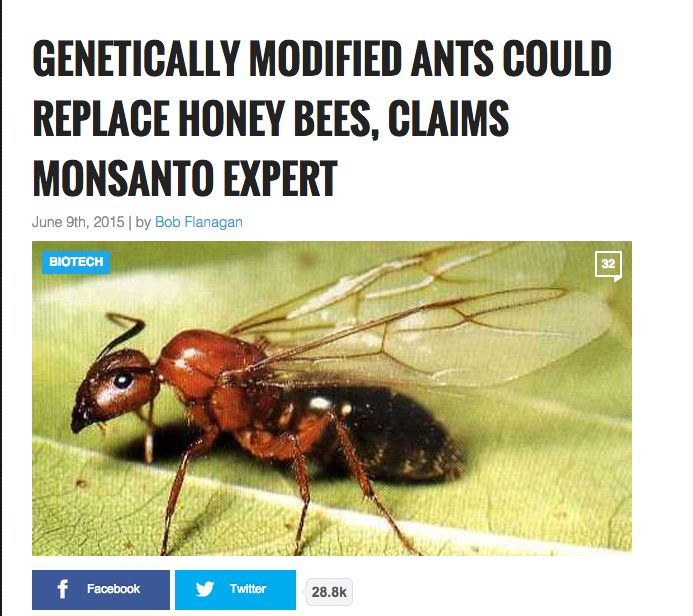 So, in the end, reports that Monsanto is developing genetically modified ants to replace honeybees are false. A Dog Meat Festival is Held Each Year in Yulin, China-Truth! Samsung Phone Batteries Have a Spy Chip-Fiction!